January - Channon Market, 2nd Sunday every month, Sovereignty Day January 26th, Canberra. Aboriginal Tent Embassy, Old Parliament House. ! ! Attention All ! ! 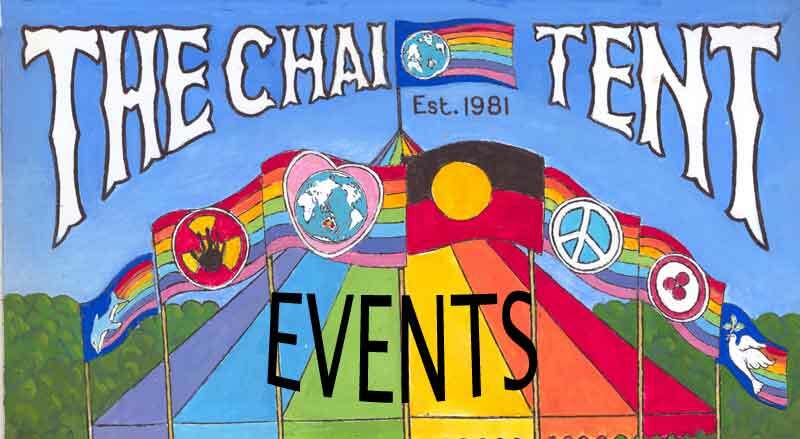 The Lismore health inspector has given the Rainbow Chai Tent at the Channon Market NSW till Mardi Grass in May 2011 to have its condemned trailer replaced. We are well short on funds at the moment to pay for the new trailer to be built. If you can help with any monetary donations or know of anyone who is interested in helping out, you can find us at the Channon Market. Please give your name and state that this money is for a new trailer. Manager of the Rainbow Chai Tent. Action with www.BennyZable.com to save Lake Cowal. Yaamma Festival in Bourke 13-17th September. September 21st, International Day of Peace, a 24 hour Vigil in Byron Bay.